Healthy treats don’t have to take a lot of time to make and don’t have to be complicated. For a convenient healthy treat, try baked tortilla chips or a handful of nuts. For a sweet healthy treat, grab a couple of Laura’s WJF bite-lettes ®. When buying pre-made goodies in the store, make sure you can pronounce the ingredients so you’re not getting highly processed food, which is often loaded with unhealthy things like trans-fats. When making healthy treats, try using raw honey or maple syrup in place of refined sugar. Dr. Laura’s DrLauraTV YouTube videos feature how to make healthy kids treats like FunFudge and popsicles. For another healthy treat option, place sugar snap peas or snapped green beans into a tightly sealed bag. Easy to carry fruits like bananas, apples, and oranges are also great healthy treats. 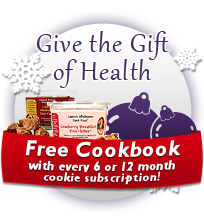 For more healthy treat recipes, see Dr. Laura’s fantastic cookbook, The Wholesome Junk Food Cookbook.